Mold Craft offers a wide range of experience across the injection mold manufacturing industry. 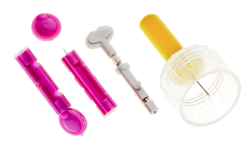 In addition to our specialties in micro injection molds and custom injection molds of all types, we’re also equipped to produce the following types of injection molds. Have an injection mold manufacturing project in the works? Contact us for more information about how we can turn your injection mold concept into reality.